Autumn is at it’s best just now in Edinburgh, surrounding us with lush greens, rich reds and burnt oranges. I’ve been carrying a pack of colourful oil pastels around with me for a week or so, since opening the box to find colours ideal to capture the changing season. Today I headed for the nearby Canongate Kirk on the Royal Mile. 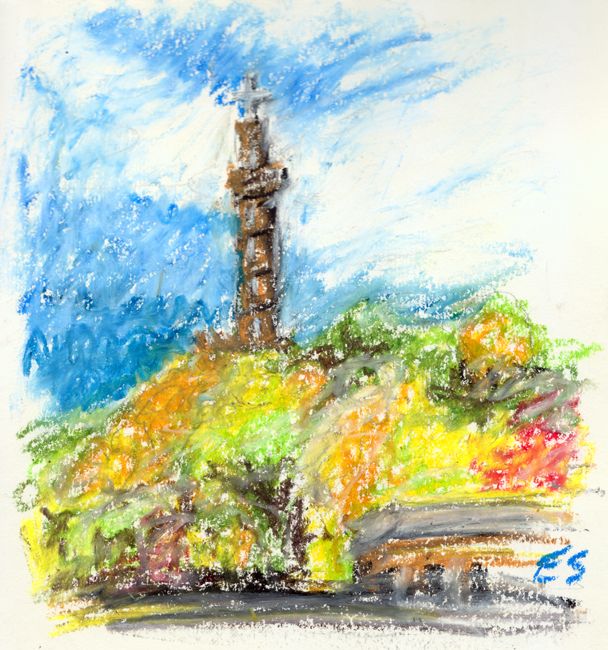 I was about to sketch a few trees, which were glowing amber against the grey/green of the headstones in the graveyard, when I spotted Nelson’s Monument, surrounded by golden trees on Calton Hill . 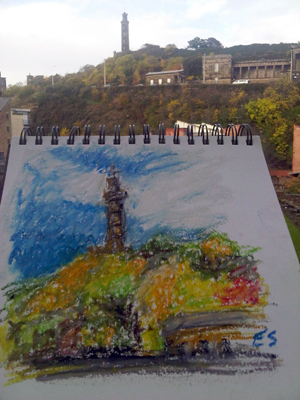 Here is a photo taken with Calton Hill in the background. The oil pastels spread into and over each other to create a thick surface of colour. Great fun!